New horn relay, long floor dimmer and courtesy light connections. Standard brake light connections with provision for a third brake light. Heavy gauge main fuse panel feed wire. Accessory circuit connection to facilitate power windows, power seats, power door locks, electric fuel pump, and spare battery circuits. Front lighting includes extra long leads for special routing when a custom under hood appearance is desired. Headlight connectors and terminals are included. Electric engine fan relay trigger circuit, horn, and gauge sender feed wiring is also included. 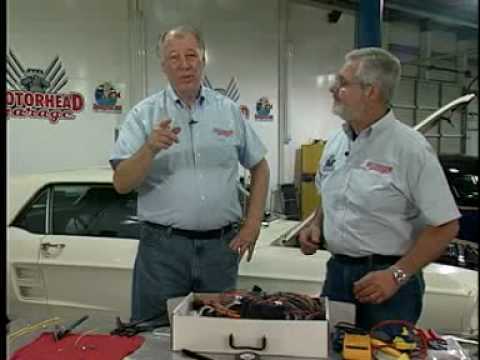 Rear body wiring includes wires for all running, directional, and stop light circuits. A fuel tank sender lead is also included. Standard turn signal and hazard flasher. Circuit wiring for electric tachometer, electric speedometer, voltmeter, oil pressure gauge, water temperature gauge, and fuel gauge. Optional connectors and terminals are available to create an “instrument cluster disconnect” for easy instrument panel mounting. Ground leads for headlight switch and all front and rear lighting. Heavy gauge alternator, main power, and starter solenoid wires. Alternator leads for one wire and GM internally regulated alternators. Heat and air conditioning lead wires as well as accessory radio and battery clock leads. Extra long ignition, accessory, and battery leads for the ignition switch. A separate alternator exciter lead wire is wired in. Steering column connectors will plug directly into most aftermarket steering columns as well as 1969 and later GM columns. Original columns can also be wired by using the supplied mating connector and terminals.